Winter, Sölden & Skiing: an adventurous blend! 432 hectares of skiable terrain. 145.5 perfectly groomed slope kilometers. 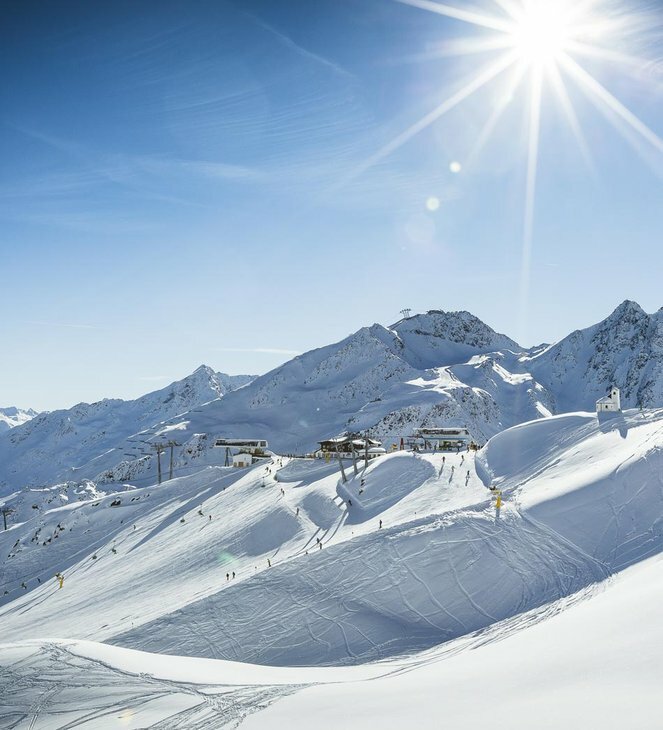 33 state-of-the-art mountain lifts plus endless opportunities: The Sölden ski area boasts incredibly varied slopes, absolute snow reliability and a dreamlike Alpine scenery. What's best, the "Golden Gate to the Glacier" ski lift connect the winter ski area directly to the 2 glacier ski mountains stretching up to 3340 meters above sea level. In need of crisp and clean air? Come and try it for yourself – before you conquer Sölden's longest top-to-bottom ski run leading on 15 kilometers from "Schwarze Schneide" at Rettenbach Glacier down to the valley, featuring a total difference in altitude of 1900 meters. base station of Giggijoch mountain gondola. Ski storage room plus boot-dryer available. Don't hesitate to contact our family in case you need useful advice or special tips – why don't you enjoy a nice chat at the homey "Zirbenstube" stone pine lounge? Also take a closer look at our unbeatable package deals ideal for memorable holidays at the Heart of the Tirolean Alps, in one of Austria's most renowned ski regions.